Unitex® Render Warehouse™, better known as URW®, is the Trade Outlet store for Unitex Granular Marble Pty Ltd. Unitex is an Australian owned and operated manufacturer and distributor of a wide range of building products suitable for both residential and commercial architectural projects. The range includes the market leading and fully accredited lightweight wall cladding system – the Unitex Base Board System; the highest quality Acrylic Renders, Textures & Finishes, Decorative Mouldings & Columns, and Render Accessories. The Unitex® and URW™ brands are built on a platform of innovation and service. Located to serve both metropolitan Melbourne & Adelaide, let our friendly technical sales team assist the development of your next project to create a truly unique and elegant exterior façade. 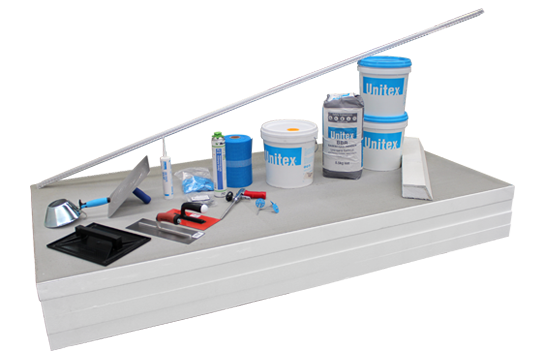 Unitex® has an ever-increasing range of Base Board, Renders, Textures, Mouldings & Columns, not to mention a great range of tools & accessories. Contact our friendly sales staff to discuss your requirements! Have a plan? Submit your plans for a quotation! Whether it be Baseboard cladding, Mouldings & Columns, or Applied Finishes, we can provide the right advice!